Elephants have been everywhere in Africa, big herds roamed the grasslands but they also adapted to life in forests and deserts. Respected by the emerging hominoid, he has accompanied man on his evolutionary path, a link that might well be imbedded in our genetic memory. 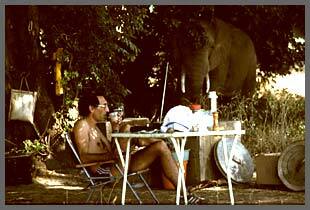 Certainly few who get to know the Elephant will not be impressed by his intelligence and touched by a family life that we can only admire with envy. It might be for these reasons that the demise of the species raises passions far beyond our general concern for the ecological disasters that surround us. 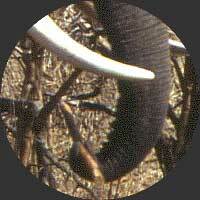 Many of the Elephant's life cycles are close to ours. They have a similar life span and the same extended period to maturity, giving time to learn. As with humans and other primates their babies have a relatively underdeveloped brain at birth with minimal innate knowledge. The brain relies on learning and is open to complex social development and the formation of culture. 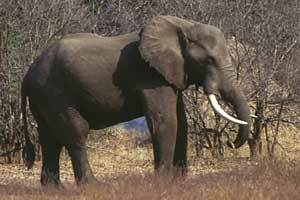 Similar to humans the average age in which elephants become sexually mature is reached at about thirteen. A cow typically produces a single calf and will continue to reproduce until mid-life. She experiences a long post-reproductive phase that is similar to the human menopause. 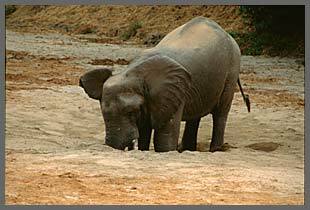 As humans, elephants can suffer from cardiovascular problems and from the age-related arthritis. 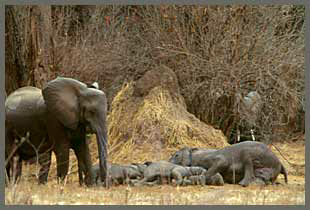 The typical family unit consists of females with their young. It is closely bonded by kinship, affiliation, experience, great loyalty and affection and is led by the most experienced female taking the role of matriarch. When males reach maturity, they leave the family to join other bulls in bachelor groups. Dominant males rejoin the family units during mating. In past relocation schemes, youngsters have often been moved to new areas and the adults were left behind, because it is so much easier to transport juveniles than an adult. However young elephants that were brought up in separation from the parents and without the guidance from adults often became delinquent. Raising an orphan baby is for the same reasons not simply a matter of providing it with the daily 10 or more liters of milk. The family is crucial in the life of the growing elephant, the tender care and love bestowed on their young may serve us as a guide on the care of own children. Elephant communicate over long distances, they do so at very low frequency sounds that are ideal for long-range communication. We can sometimes hear their "rumble" but most frequencies are below the range of human hearing (an excellent book "Silent Thunder: In the Presence of Elephants" by Katy Payne offers an insight on that subject). Elephants may journey together kilometers apart for days, keeping in touch by sound - language actually. Research and observation has proven that elephants are indeed capable of many complex functions of thought and feeling, their emotional intelligence and high order of consciousness becomes evident to those who observe these magnificent animals in the wild.